Nami is the water caster Riot teased the other day. She “channels the primal energies of the ocean” and has access to a generous catalogue of buffs. That’s not all there is to her, of course – you’d be right in thinking that there’s nothing defensive about an ultimate named Tidal Wave, for instance. Tidal Wave sees a long range wall of magic damage fired from Nami’s feet, which slows every enemy unit it passes through. The closest enemies are slowed the most. Buffs come in the form of Tidecaller’s Blessing, which stacks extra slowing and magic damage on a targeted allied champion’s attacks, and Ebb and Flow, a chain attack which heals allies and hurts enemies. Both are complemented by the passive Surging Tides, which increases the movement speed of allied champions affected by any of Nami’s abilities. The cherry on the bakewell is Aqua Prison, a location-targeted magic damage bubble which stuns hit enemies. 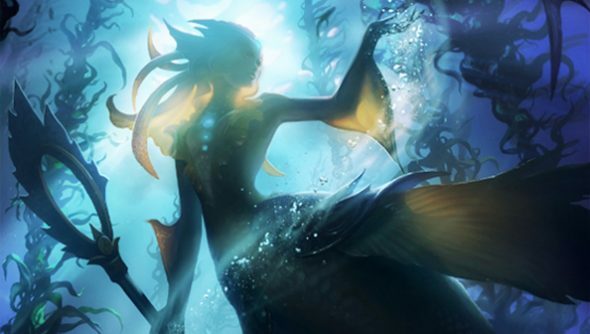 Riot recommend Nami be used to apply “constant pressure” to the enemy: “The buffs provided by Tidecaller’s Blessing allow her lane partner to come out ahead in exchanges, and the long-distance stun from Aqua Prison can keep low health enemies from engaging safely. “Moreover, because her healing skill also bounces to damage nearby enemies, Nami’s core support abilities work best when her partner is on the attack. “Balancing her offensive capabilities and defensive utility will be crucial to success with Nami. Learn to ride the rolling wave, and you may find your team swimming to victory,” conclude the developers. Tempted to take on a champion better equipped to help than hinder? Let us know your thoughts on Nami in the comments.